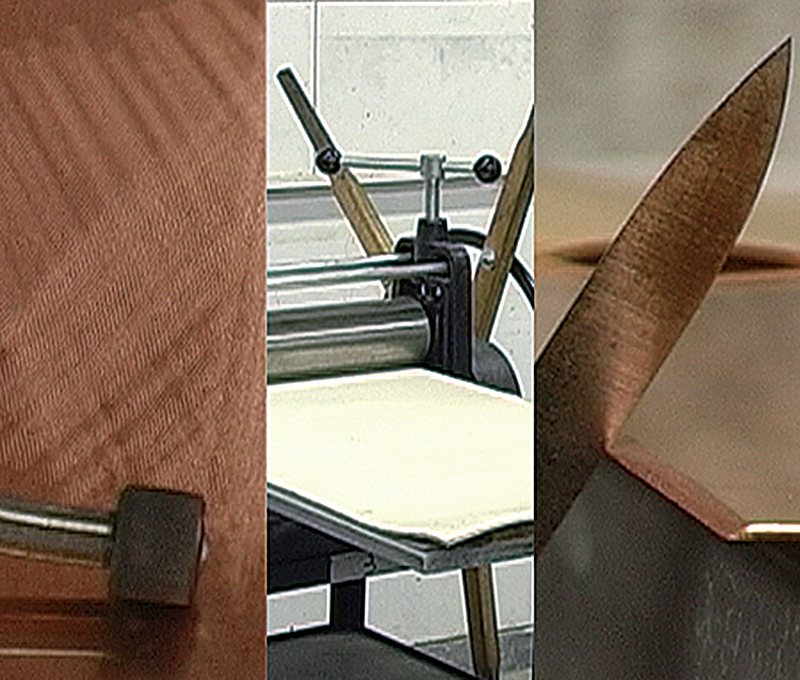 Copperplate printing is one of the forms of intaglio printing in which grooves are formed in a pressed copperplate by a physical process such as engraving or acid etching. Ink is then packed into this and is transferred from the plate to paper with a press. Copperplate printing is said to have originated in the 1400s to print designs by the metalsmiths who did the engraving on metal fittings, etc. Originally they used iron rather than copper but copperplates came into use from the latter half of the 1400s. There are broadly two types of plates or substrate used in copperplate printing: direct intaglio (engraving) and indirect intaglio (etching). Direct intaglio techniques include engraving, dry point and mezzotint. These are used to create grooves by carving directly into the plate with a sharp instrument known as a needle or a burin. Indirect intaglio techniques include etching, aquatint and soft ground etching. These are methods by which grooves are etched into the working surface using aqueous ferric chloride or nitric acid aqueous solution. Engraving with a burin was the mainstream method for the first copperplate prints. The idea of etching was conceived in the 16th century and aquatint came into use in the 17th century. Today, many artists create their works with a combination of various techniques including etching, aquatint and dry point. There are also several other plate making and printing methods such as photo-etching with photo-sensitive solutions, as well as uneven plate printing where the ink is loaded simultaneously onto the intaglio and relief sections and printed off, and Chine-collé which is printed on ganpishi washi paper.